These help windows will explain what content is needed for each string specification box as you fill out the form. It is not necessary to fill in every box or know every specification. Fill in the boxes that pertain to your situation with the information you have or that is required. Hit the Payment button when you've finished. Once you have entered your information you will either graduate to the payment page or the form will indicate which boxes still need to be filled in. Once you graduate to the PAYMENT PAGE you cannot return and alter the specifications. Continue and pay for the order or cancel and start over. Your credit card number is processed through "Stripe" a well established credit card processing company similar to Pay Pal only easier. If you don't pay at this point, all the piano measurements and credit card info you just entered will vaporize for security reasons. You will have to start over. ***Turn your sound on and click the arrow in the window box above to play the help video. To learn what information to enter in this box, click the arrow in the lower left corner of the purple box below to play the video. Turn your sound on and click the video screen arrow to play. To learn how to identify a "STRING NUMBER", click the arrow in the lower left corner of the window below to play the help video. Turn your sound on and click the arrow in the window above to play the video. To learn how to identify a "Key Number", click the arrow in the lower left corner of the window below to play the help video. Turn your sound on and click the arrow in the window above to play the help video. To learn how to identify a "Note Name", click the arrow in the lower left corner of the window below to play the help video. To learn how to identify a "String Type", click the arrow in the window below to play the video. Turn your sound on and click the arrow above in the window above to play the help video. To watch a demonstration of measuring from the hitch pin to the speaking bridge pin which is the lower termination, click the arrow in the window below to play the video. Turn your sound on and click the video screen to play. Measure the diameter and length of the old pin. Select a new pin that is the same length but next size larger and test for increased tightness. The direction is determined by facing either end of the string and observing which direction the copper is pointing. CLOCK-WISE or COUNTER CLOCK-WISE. "How to Measure the EXPOSED CORE distance"
This measurement is the short distance between the upper termination point (Agraffe,Capo or Guide pin) and the end of the winding. 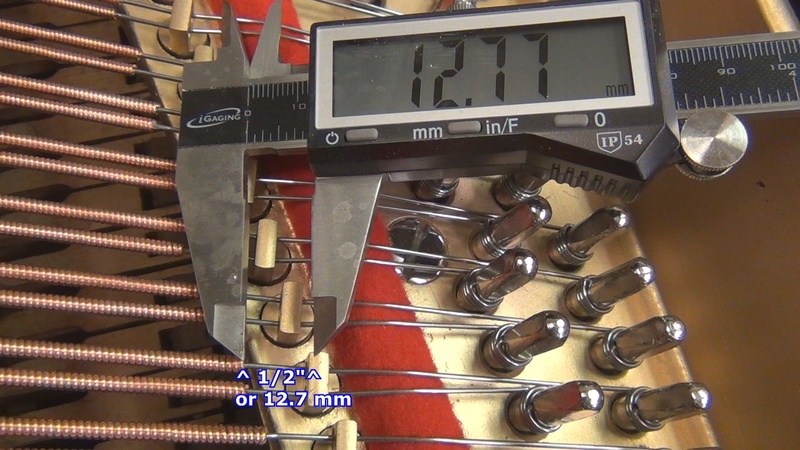 On most pianos this length is usually between 1/4" and 3/4" when measureing the string at pitch inside the piano. 1/2 inch is ideal in most cases. More than 1 inch can cause fine tuning issues. If no measurement is provided here we will default to 1/2 inch (or 12.7 mm) exposed core distance. CLICK anywhere on rear page to close this help window. "How to Measure the EXPOSED CORE (LOWER)"
This measurement is the short distance between the lower termination point (speaking bridge pin in most cases) and the beginning of the winding. 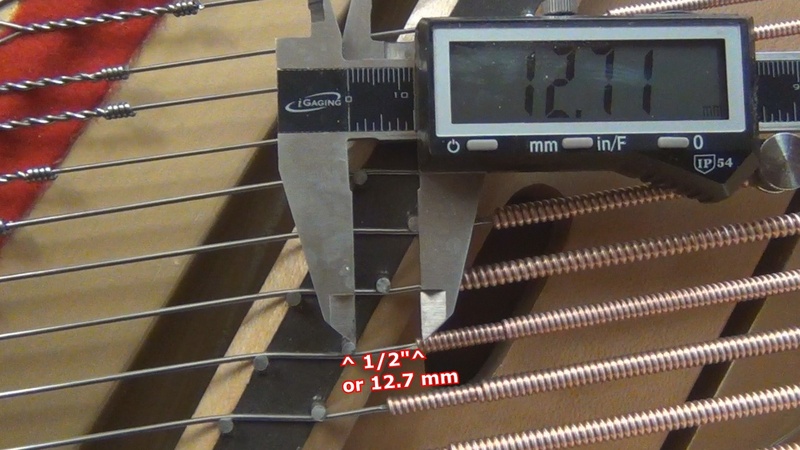 On most pianos this distance is between 1/4" and 3/4"when measuring the string at pitch inside the piano. 1/2 inch or 12.7 mm is ideal in most cases. More than 1 inch can cause fine tuning issues. If no measurement is given we will default to 1/2 inch (or 12.7 mm) exposed core distance. No sound on this video. No audio with this video. For a lesson in how to measure in millimeters watch the video below. Turn your sound UP and CLICK the video screen to play. If ordering more than 10 single string replacements, consider the option of ordering a complete set of bass strings. The cost per string can be as low as $7.85 vs. $20.00. If ordering individual replacement strings, the cost per string is $20.00or less. The form below will accomodate ordering up to 10 individual replacement strings. for information to prevent filling out this form only to have it accidentally vaporize before submitting. ARGH!!! And there's a short video overview. We will ship USPS Priority Mail up to 10 strings for $7.95, unless otherwise specified. To continue you must tell us the total number of strings being ordered? Specifying the Note Name,String Type, Hitch Pin to Lower Termination and Hitch Pin to Upper Termination is essential for designing and producing the optimal string. The additional information is appreciated but not essential. Non essential information includes diameters. This means that a micrometer is not needed. Measuring the old string is a less than optimal method of ordering. Use this method if the measurments from inside the piano cannot be obtained. Knowing the note name will allow us to evaluate the tolerances of the old string and prevent us from duplicating a bad design. We will improve it if possible. If the note name is not provided, we will make the string to your specifications but cannot assume responsibility for the results. Do not install this string like an Arledge Optimized String. Install it in the traditional way. Since the design tolerances are not known, do not overstretch this non-Arledge design string more than 20 cents above pitch. The specifications below are not essential. However, they provide addtional information for customizing your string to match its original neighbors. If specifications are not entered in these fields we will default to our standards: 1.85 inches loop length (standard loop), standard loop type, 2/0 tuning pin size, counter clock-wise (American standard) winding direction, and 1/2 inch exposed core distances. 1/0=.276", 2/0=.282", 3/0=.286", 4/0=.291", 5/0=.296"
usually 3/8 inches to 1.25 inches.